It has been a productive time for the Clinton Foundation. We continued the life-changing work around the world that many of you know us for – helping farmers in Africa, fighting climate change by promoting renewable energy, and opening opportunities for girls and women. We also devoted more resources to our U.S. efforts – combating the opioid epidemic, helping more schools and communities get healthier, supporting parents with early learning resources for their children, empowering young people to make a difference in their communities, and mobilizing relief and recovery efforts in the wake of devastating hurricanes. Every day, we build upon the simple belief that everyone deserves a chance to succeed, everyone has a responsibility to act, and we all do better when we work together. Our work improves lives across the United States and around the world by bringing together partners to create economic opportunity, improve public health, and inspire civic engagement and service. For example, over the past year, we visited Jacksonville to see how our work on the opioid epidemic is helping prevent overdose deaths. We went to St. Louis to see how our work is helping children lead healthier lives thanks to better food and exercise options at school. And, we visited Baltimore to see how our work is helping parents utilize new resources to strengthen the healthy development of their young children. We traveled to Boston to hold our 10th annual Clinton Global Initiative University meeting and celebrate a decade of exceptional students who are engaged in their communities and turning their ideas into action for positive change on today’s most pressing issues. At the invitation of local leaders, we went to Puerto Rico, the U.S. Virgin Islands, and Dominica in the wake of last year’s catastrophic hurricane season to better understand the needs on the ground and unique ways we could help with rebuilding efforts across the Caribbean. Together with partners, we delivered critical medical supplies and solar equipment and launched the CGI Action Network on Post-Disaster Recovery, which began generating Commitments to Action to help the region recover and rebuild. We’re grateful for everything you’ve done to support this work. Whether you’re among the more than 340,000 supporters who have made a donation, a partner who helps us conduct our work on the ground, or one of the many gifted members of our staff – we’re changing lives, together. 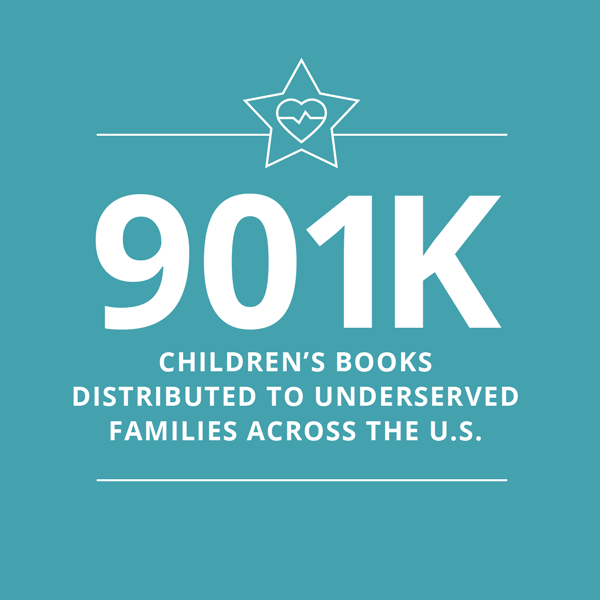 The progress chronicled in this report belongs to the people we serve, the partners we work with, and to you. The 2017 hurricane season was unprecedented in its devastation, leaving more than 3.4 million Puerto Rican citizens reeling from massive power outages and an overwhelming shortage of medical supplies months after Hurricane Maria made landfall. In the immediate aftermath of the storm, the Foundation’s Clinton Global Initiative (CGI) mobilized partners to get critically-needed medical and solar supplies to people on the ground. In October 2017, Direct Relief, CGI, and other partners delivered the largest emergency airlift of medical aid to the Caribbean region – roughly 150,000 lbs including intravenous solutions and prescription medications for acute conditions and chronic diseases, such as diabetes and hypertension. In December, Direct Relief chartered an aircraft to deliver an additional 40 tons of medical aid specifically requested by members of Puerto Rico’s medical community. We didn’t stop there. CGI also announced an exciting new partnership with The Solar Foundation, Operation Blessing, Direct Relief, and industry partners to restore power in a sustainable way and help safeguard against power outages from future storms. 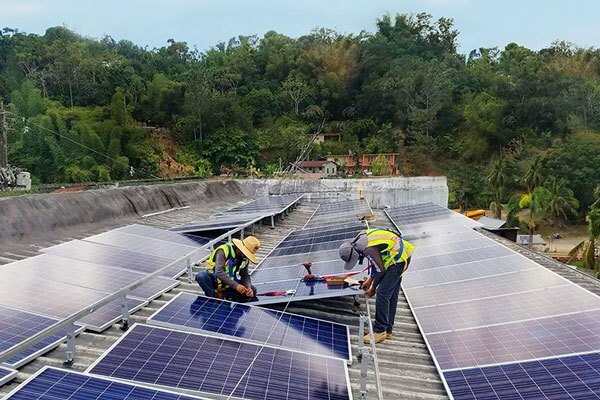 The project, “Solar Saves Lives,” launched with more than $2.5 million in donations and donated solar equipment that will solarize critical infrastructure like markets and medical centers in rural and underserved areas by working with local organizations like New Energy Puerto Rico and the Puerto Rico Primary Care Association. In November 2017, President Clinton traveled to Puerto Rico to meet with people and families impacted by the hurricanes, support the work of CGI partners, and speak with community and local leaders, including Governor Ricardo Rosselló, San Juan Mayor Carmen Yulín Cruz, Resident Commissioner Jenniffer González-Colón, and local mayors. He also spoke with a local U.S. Air Force veteran who was displaced from his home by the storm and sought shelter with his son at a temporary facility in Canóvanas. He had just come out of surgery and was being escorted to a new location in the facility when he saluted President Clinton. The two spoke about the man’s service to his country, the desperate conditions on the ground, and their shared hope for building back better. He was one of the many people President Clinton met whose story has informed our efforts. By listening to the people we met in the communities affected, we learned firsthand of the devastation and needs facing our fellow Americans and those who live in the Caribbean. And that’s why the work continues to support hurricane recovery in Puerto Rico as well as the U.S. Virgin Islands, Dominica, and the Caribbean over the long term. In 2018, President Clinton launched the CGI Action Network on Post-Disaster Recovery to advance long-term disaster recovery and economic revitalization efforts as well as to work toward greater resiliency in the Caribbean region. In April 2018, President Clinton brought together more than 350 leaders focused on recovery in the Caribbean to discuss and announce new solutions to continue rebuilding and resilience efforts. With the next hurricane season approaching, we have a unique opportunity to build back in the region in a way that improves people’s life chances not just today, but also long into the future. This effort will provide a model for resilient, inclusive development that can help inform and guide future disaster recovery efforts for years to come. 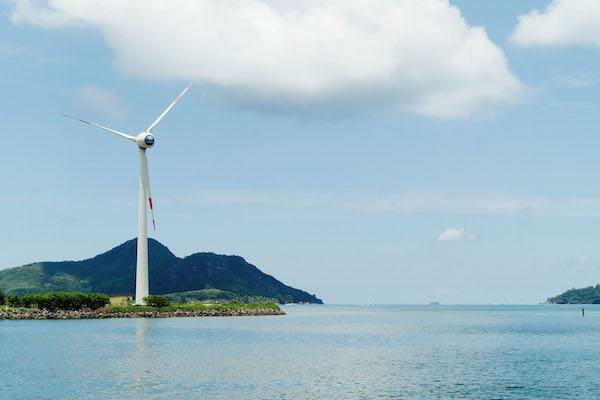 The Clinton Climate Initiative (CCI) supports islands on the front lines of climate change. 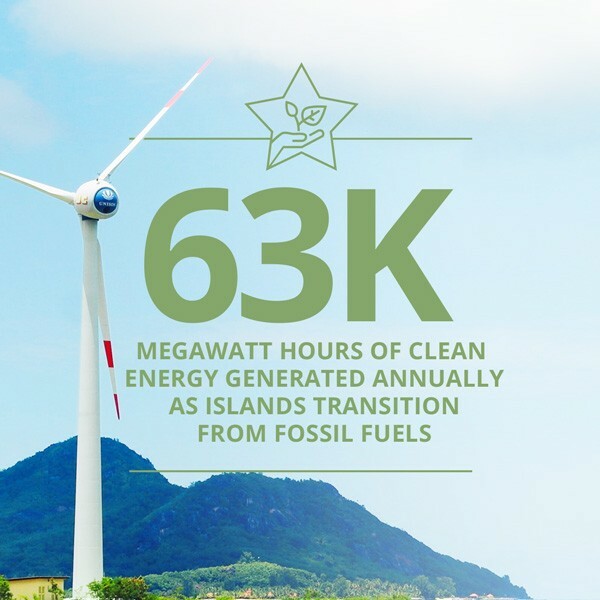 CCI works with more than 12 island nations to assist with their transition from fossil fuels to clean energy, helping generate 63,000 MWh of clean energy annually. 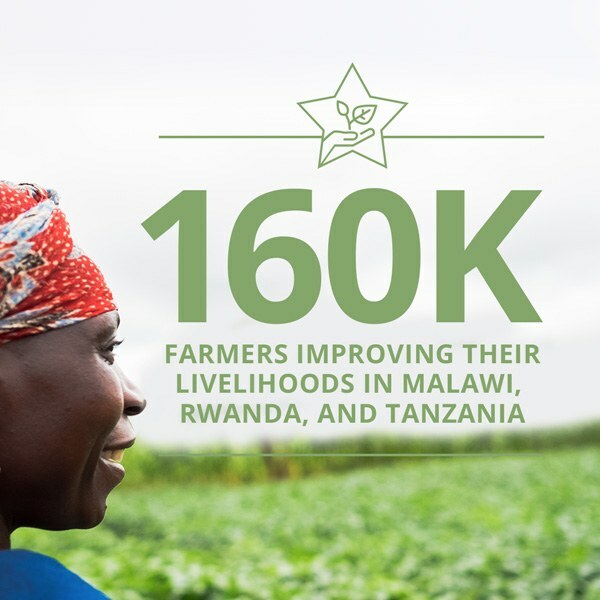 Since it was first founded, the Clinton Development Initiative (CDI) has provided on-the-ground assistance to 160,000 farmers in Malawi, Rwanda, and Tanzania. 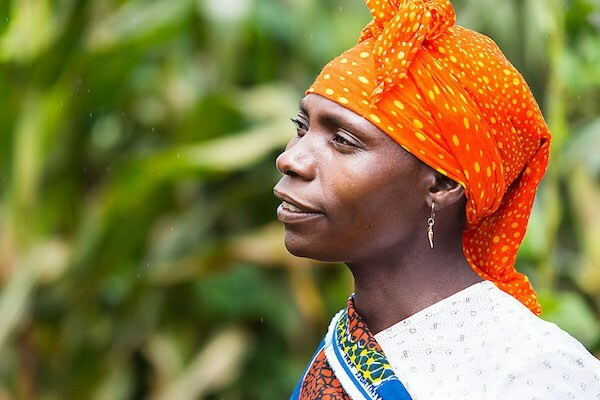 CDI works with farmers by training them on best agricultural practices including how to mitigate against the impacts of climate change, providing quality inputs like seeds, and connecting them to markets to sell their crops. This creates opportunities for farmers to generate income that supports their families, communities, and the growth of local economies. The Clinton Giustra Enterprise Partnership (CGEP) has helped more than 600,000 people worldwide by building and managing businesses that empower farmers, fishers, and women entrepreneurs. CGEP provides training, financing, technology, and sustainable access to high-value markets for these groups to sell their goods. In 2017, CGEP joined an effort to accelerate the progress of the UN’s Sustainable Development Goals. CGEP advances inclusive business models worldwide, including by working with 1,000 farmers in El Salvador, and more than 4,200 farmers in Haiti. 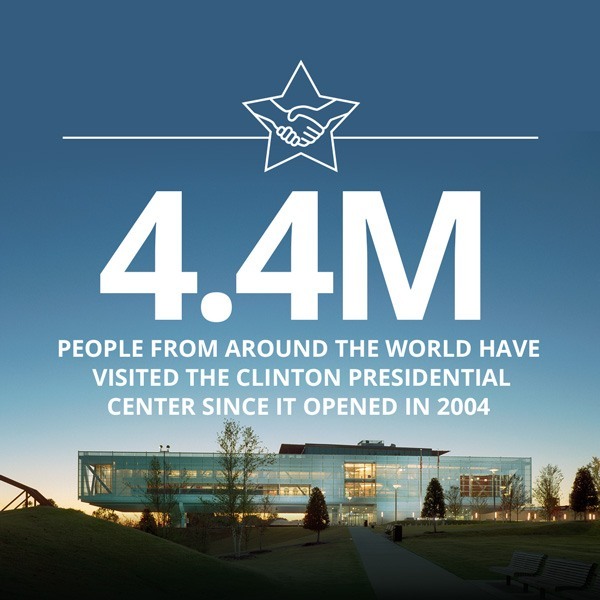 In 2017, the Clinton Presidential Center (CPC) welcomed more than 327,000 visitors to experience its unique exhibits and grade-level specific educational programming. The CPC’s impact extends well beyond the walls of the building and into the heart of the community to help address some of the challenges facing educators, students, and their families. Arkansas schools are charged with preparing children for the future, however limited time and resources often affect their ability to fully meet the considerable challenges. That’s why CPC staff and volunteers work each and every day to bridge some of the gap by serving as an extension of the classroom. As part of President Clinton’s vision, every school group has the opportunity to visit the Clinton Center at no charge. In 2017, 42,000 students, educators, and their families participated in educational programs, community events, and exhibit tours. Select highlights included the annual “Head of the Class Bash,” a back-to-school festival where CPC staff and partners distributed 3,000 backpacks filled with required school supplies and provided free immunizations as well as dental and health screenings. In February, the CPC introduced “Fusion: Arts + Humanities Arkansas,” a program that promotes cultural heritage and celebrates creative achievement by weaving together the arts and humanities. The first Fusion focused on the Quapaw Tribe in Arkansas. President Clinton attended the openings of three new special exhibits at the CPC. 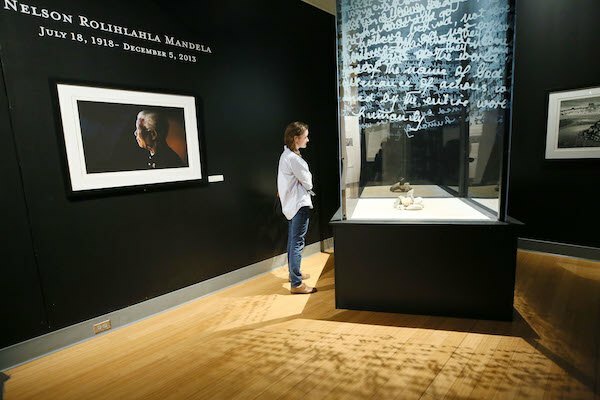 “Xtreme BUGS” was an exploration of how some of Earth’s most fascinating inhabitants cooperate to survive; “Mandela: The Journey to Ubuntu” chronicled the life and legacy of Nelson Mandela; and “Art of Africa: One Continent, Limitless Vision” highlighted the colors, shapes, and textures of the African continent through its art. President Clinton also participated in the 60th anniversary commemoration ceremony of the integration of Little Rock Central High School together with the living members of the Little Rock Nine. Every 19 minutes, someone in the United States dies from an opioid-related overdose. The opioid epidemic has become a spiraling crisis and more must be done. Since 2012, President Clinton and the Clinton Health Matters Initiative (CHMI) have worked to fight the opioid crisis by working with partners to increase access to lifesaving medication and grow the body of research and evidence for preventing overdoses and treating victims. Over the past year, that work continued as CHMI expanded and accelerated its efforts to stop overdose deaths, provide training and resources to communities, and promote evidence-based solutions to first responders and families nationwide. In fighting the opioid epidemic, one drug, naloxone, is proven to reverse the effects of an opioid overdose and save lives. In 2017, we expanded our partnership with Adapt Pharma to make 40,000 doses of naloxone available for all colleges and universities in the United States to access. The partnership built upon earlier agreements to provide access to naloxone to every high school in the United States as well as community-based organizations in need. In addition, CHMI announced a new course provided by Harvard Medical School that expands training for medical professionals and community first responders on how to encourage people to get treatment. The tool also helps communities take steps to reduce the stigma many victims or their families might feel and create a culture that understands that substance misuse is a serious health issue. And, over the past several years, we’ve worked with Johns Hopkins University’s Bloomberg School of Public Health to advance more academic research, scholarship, and recommendations for combating the opioid crisis as a nation. In October 2017, CHMI and Johns Hopkins convened leaders for an Opioid Summit, and released a landmark report titled, “The Opioid Epidemic: From Evidence to Impact,” which identifies evidence-based steps for urgent action. We’re working to empower any concerned citizen, organization, or company to play a role in fighting this crisis and saving lives. By increasing access to naloxone, providing new resources for communities, and supporting first responders and families who are on the front lines, we can all make a difference. Since 2002, the Clinton Health Access Initiative (CHAI) has worked to combat the HIV/AIDS epidemic in the developing world by increasing access to antiretroviral treatment, care, and testing. To date, more than 11.5M people have had access to CHAI-negotiated prices for HIV/AIDS drugs. Previously part of the Clinton Foundation, CHAI became an affiliated organization in 2010 and a fully independent entity in 2017. In December 2017, President Clinton commemorated the National AIDS Memorial, which he designated as a national monument in 1996. Since it was first founded, the Alliance for a Healthier Generation has provided healthier learning environments for more than 26 million students in more than 40,000 schools nationwide by providing free resources and technical assistance. In 2017, Healthier Generation, co-founded by the American Heart Association and the Clinton Foundation, recognized more than 300 of “America’s Healthiest Schools” in its Healthy Schools Program. 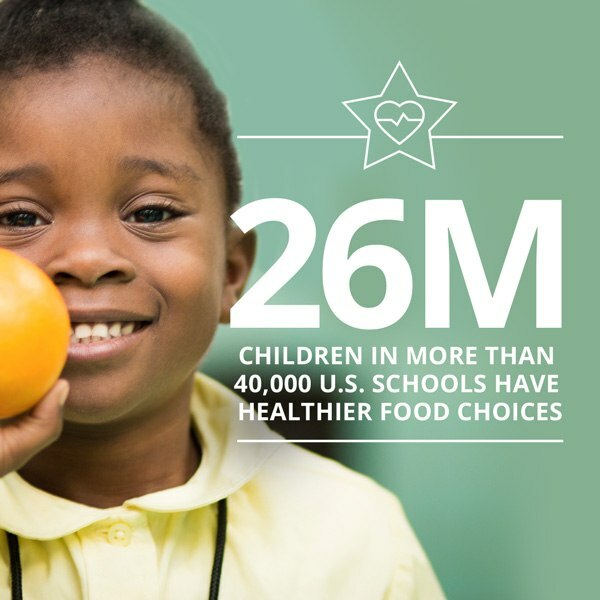 These schools meet rigorous criteria to serve healthier meals and snacks, offer high-quality physical and health education, and empower students to become healthy role models. In November 2017, President Clinton visited two of America’s Healthiest Schools in St. Louis, which have found creative ways to promote healthy habits, such as daily morning meditation, routine exercise breaks, a community garden, and healthier breakfast and lunch options. Educators have also worked together to make their water fountains lead-free. President Clinton met with the students and educators to learn more about their work and to talk about the importance of eating right and exercising. Too Small to Fail promotes the importance of children’s early brain development by providing parents and caregivers with information and tools to help them talk, read, and sing with their children from birth. To date, Too Small to Fail has partnered with Shane’s Inspiration and Landscape Structures to develop and integrate early learning messaging into more than 150 playgrounds across the country. Too Small to Fail works to meet families where they are in other everyday places, such as laundromats, grocery stores, and bus shelters. In October 2017, President Clinton traveled to Baltimore to see Too Small to Fail’s work with the Baltimore County Public Library, cutting the ribbon for new literacy-themed playground panels and seeing firsthand the early learning resources Too Small to Fail is providing to local parents, caregivers, and community partners, including Women Infants, and Children (WIC) clinics. In addition, Too Small to Fail works with partners in the entertainment industry to raise awareness about children’s early brain development. In 2017, Chelsea Clinton hosted a writers’ room briefing with producers, writers, and creative teams on how simple steps like talking, reading, and singing can boost every child’s chance at success. To date, 13 TV shows – including “Law & Order: SVU,” “Days of our Lives,” and “Jane the Virgin” – have integrated messaging about early childhood development into their programs. Too Small to Fail also continued its multiplatform campaign with Univision to support Hispanic parents and caregivers in promoting their young children’s early brain development. Too Small to Fail and Univision debuted a first-of-its-kind TV miniseries, “La Fuerza de Creer” (“The Power of Believing”), which conveyed the importance of early brain and language development. They also targeted messaging about early brain development on Univision’s hit reality competition show “Pequeños Gigantes USA,” and expanded the reach of their text message program for parents, offering twice weekly tips to promote early brain development and access to early learning activities. Through its Community Health Transformation program, the Clinton Health Matters Initiative (CHMI) works on the ground with communities to help them improve the health and well-being of local residents. In Adams County, Mississippi, CHMI launched an effort with the Natchez Chamber of Commerce and the Mayor’s Office to help businesses support employee health by providing tools and resources. The effort includes simple steps for businesses to create and implement an employee wellness plan for physical activity, nutrition, mental health, and substance abuse. Read the Adams County Blueprint. In Arkansas, CHMI partnered with The Arkansas Campaign to Prevent Unplanned Pregnancy to promote and provide preventative sexual health education alongside its partners. This effort facilitated the establishment of a new free-standing agency that will provide guidance to more than 40 Arkansas college campuses with solutions to address teen and unplanned pregnancy. Learn how we’re promoting healthy living in Little Rock. In Houston, Texas, CHMI revitalized a community playground with Too Small to Fail and local officials. The playground features visual prompts and illustrations to encourage families to talk, read, and sing together about healthy foods and ways to stay physically active together. Go #OnAssignment with our team. In 2017, we graduated our third class of Presidential Leadership Scholars (PLS). The PLS program is an unprecedented partnership among the presidential centers of William J. Clinton, George W. Bush, George H.W. Bush, and Lyndon B. Johnson that brings together leaders from diverse backgrounds to learn a brand of principled leadership that transcends differences and demonstrates the power of working together to achieve lasting change. As part of the 2017 graduation, Scholar SreyRam Kuy, M.D., M.H.S. 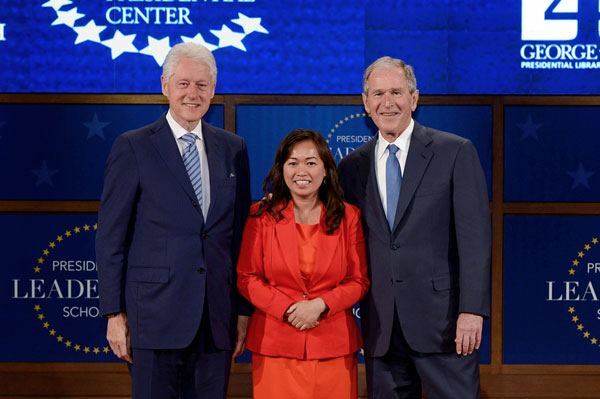 (pictured right), who was chosen by her colleagues to represent their class, delivered a powerful keynote address about her pursuit of the American dream and the opportunities she found after fleeing to the United States as a child and refugee from Cambodia. During the ceremony, President Bill Clinton and President George W. Bush met with Scholars and shared the stage to discuss their experiences on leadership and cooperation from their administrations and foundations. The latest class joins an active network of 181 Scholars who are applying the lessons learned in the program to make measurable change in their communities, our nation, and the world. Examples of these Scholar-led efforts include providing employment opportunity and mentorship to veterans, establishing new systems for re-entry from the criminal justice system, combating the opioid epidemic through doctor training and patient care, deploying much-needed resources in the wake of natural disasters, and so much more. The Presidential Leadership Scholars program continues to grow each year. In February 2018, PLS announced the fourth class of 59 new Scholars, including veterans, educators, doctors, public servants, and corporate professionals ready to make a difference in their communities. 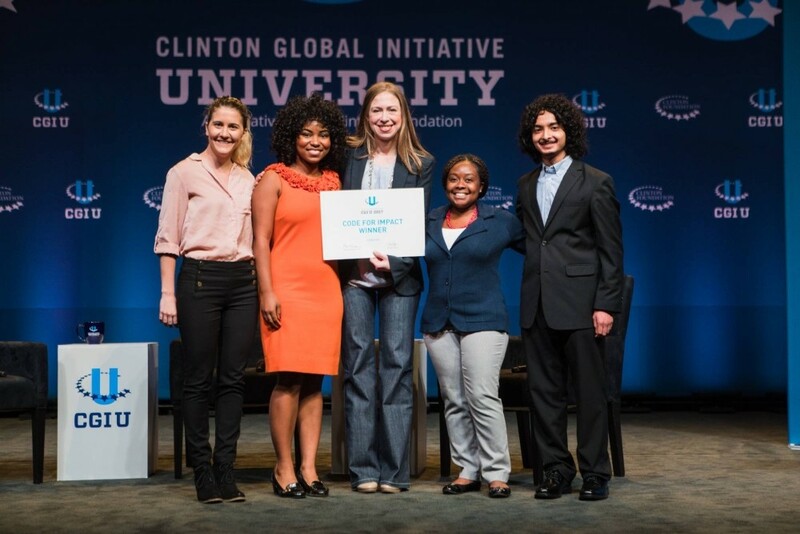 In 2017, the Clinton Global Initiative University (CGI U) marked 10 years of advancing its mission to inspire college students from around the world to develop meaningful solutions to global challenges. 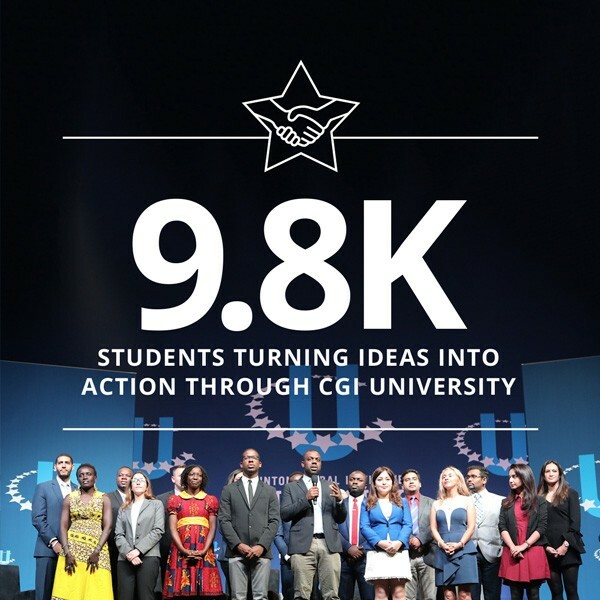 Since it was first founded, CGI U has brought together more than 9,800 students from across the country and around the globe to address the critical issues we collectively face, including human rights, climate change, gender equality, public health, and violence worldwide. Together, students have made more than 7,000 Commitments to Action on issues, including hurricane and disaster response, the opioid epidemic, relief for refugees and displaced populations, violence against women, and more. Many CGI U alumni have been recognized as innovators in their field, including several who have been named to Forbes 30 Under 30. At the 2017 CGI University meeting at Northeastern University, 1,100 students from more than 80 countries and 250 universities came together to engage and develop action plans for their communities. President Clinton and Chelsea Clinton hosted students and special guests, including Rep. Joseph P. Kennedy III (MA-04); Olympian Ibtihaj Muhammad; 19th Surgeon General of the United States, Vivek Murthy, M.D. ; Partners In Health co-founder, Paul E. Farmer, M.D., Ph.D.; former Secretary of State Madeleine K. Albright, and many others. Students named to the CGI U Honor Roll, a roster of extraordinary alumni who over the past decade have made a significant impact through their commitments and careers, were also celebrated and acknowledged throughout the event. In November 2017, the Clinton Foundation marked the 25th anniversary of the election of Bill Clinton as the 42nd president of the United States and Al Gore as the 45th vice president. Former campaign and administration officials came together at Georgetown University to look back on President Clinton’s journey to the White House, his time as president, and his vision for the country and the world. The Day of Action program was founded by Chelsea in the wake of Hurricane Sandy in 2012 and has since mobilized more than 7,200 volunteers and donated more than 29,000 volunteer hours across the United States. Throughout 2017, Chelsea Clinton and the Clinton Foundation hosted several Day of Action service projects to help revitalize local communities and support families in need. In Boston, more than 475 college students and community members joined President Clinton, Chelsea Clinton, and Boston Mayor Marty Walsh to refurbish playgrounds, clean up local parks, construct mini-libraries, and restore wetlands. In New York, the Foundation partnered with the National Diaper Bank Network and the HopeLine, which helps low-income families in the South Bronx. Working together with Too Small to Fail, volunteers bundled packs of more than 5,000 diapers and 1,000 new children’s books for young families in need. 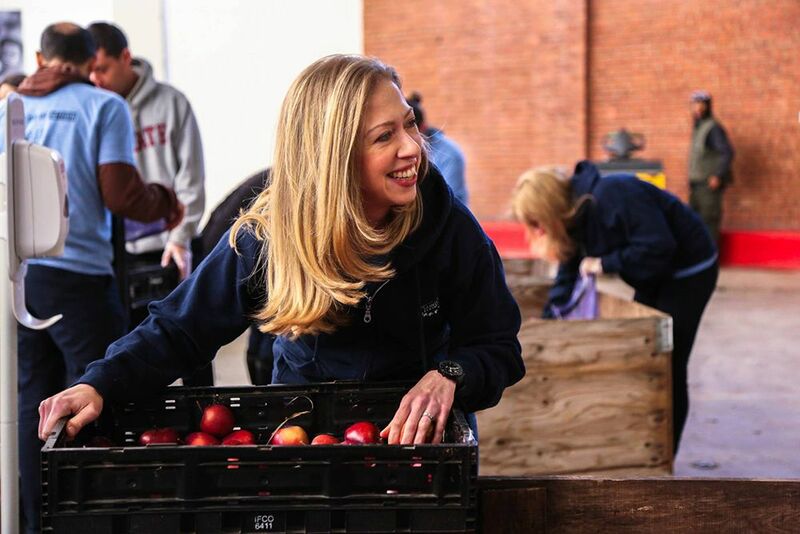 In addition, Chelsea Clinton led two Day of Action service projects with City Harvest to reduce food insecurity in New York City. Volunteers packaged more than 32,000 lbs of produce to be distributed to New York children and families in need. The Day of Action program was founded by Chelsea Clinton in the wake of Hurricane Sandy in 2012 and has since mobilized more than 7,200 volunteers and donated more than 29,000 volunteer hours across the United States. President Clinton established the Clinton Foundation on the simple belief that everyone deserves a chance to succeed, everyone has a responsibility to act, and we all do better when we work together. Thanks to you and your support of the Foundation, we’ve been able to expand our impact and continue to improve lives in the United States and around the world. Our 2017 Impact Report features the stories of how we’re working together with our partners to create economic opportunity, improve public health, and inspire civic engagement and service. Our programs have grown in unique ways through the years – ranging from helping farmers in Africa increase their yields and incomes to mobilizing relief efforts in the wake of natural disasters; from confronting public health crises such as the opioid epidemic and childhood obesity to combating the effects of climate change in the Caribbean through clean and renewable energy efforts. We’re also committed to cultivating a diverse, new generation of leaders who are creating meaningful change on college campuses and in communities across the country and around the world. And, as you’ve seen in this report, so much more. 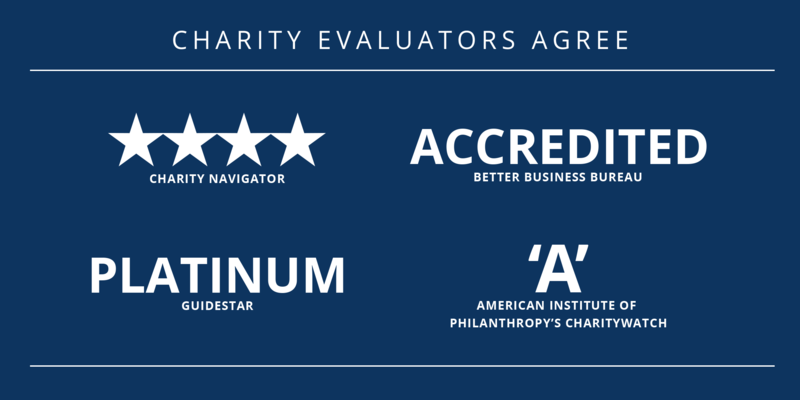 We are incredibly proud that charity evaluators like Charity Navigator, CharityWatch, GuideStar, and the Better Business Bureau have given us top ratings. This helps you know we make the most of every single dollar that is contributed. Now more than ever, we must do everything we can to make a difference in the lives of others. There is important work ahead and you are a critical partner. So, on behalf of President Clinton, Chelsea Clinton, the Board of Directors, and everyone at the Clinton Foundation, we thank you for your trust and continued generosity and support. We’re grateful that you choose to work with us to build a better future for our children, our families, and our communities.